After hard work & efforts, you will not get your file to success or promote your blog, and you may be wondering about your "blog" progress. So you are not alone to face this issue. Today, I will discuss with you powerful techniques to solve this issue easily. 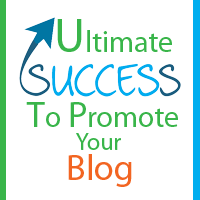 Promoting your blog in the right way, and your statistics with search engines is good. The following techniques is the success of your blog. If you simply apply these techniques to your blog is bringing out some positive results quickly. The best way is through promoting your blog content through social media sites and also bookmarking sites, all over the web to make it accessible everywhere. Because many people use social media every day to connect each others. Social media sites help you to network in the best way, and make anything famous instantly. Related Posts: Build High Quality Backlinks. You also submit your links to other website, write comments to other websites with your blog URL. These techniques are very helpful to ultimate success and promote your blog, with good SEO result. Always write valuable and unique content. When you are writing your blog post, always write some interesting or take something new. If your content is interesting to read in the users will come back to your blog again. Related Posts: Write Best Articles And Boost Your Blog Traffic. How To Write Quality Content. Only write good content is not to be enough for your blog. Write some "Keywords" to make your posts keywords optimized in search engines. After this your posts optimized and upfront in search result in google search engines also. The very important thing to success your blog, build relationship with people, only then you can expect to increase your followers or subscribers. Make sure your content is according to the needs of your audience. And you gain highly build a relationship to the user. Related Posts: Interlinking Are Increase Your Blog Traffic.